We were contacted by the International Fund for Animal Welfare (IFAW) about an event center using animals for exhibition. The US Fish & Game authorities declared their tiger enclosure to be non-compliant. The owner was given 60 days to upgrade it, but he claimed that would be impossible to do. two tigers, two servals, and two caracal brothers named Nigel and Ivan. Another sanctuary offered to take in a lynx from the event center and provide transport for the cats to us, too. Everything was in place. But then, the owner decided he would not surrender all his cats. 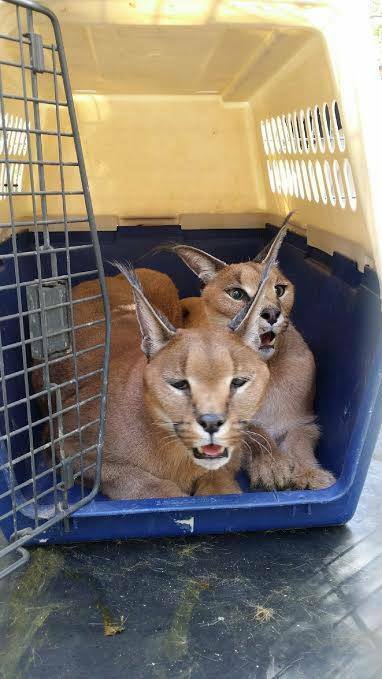 We stood by our commitment to provide a home for Tonka, the tiger, and the two caracals he agreed to release to us. We also offered, in the spring, to pick up the two servals he still has on display there as well as his remaining white tiger. 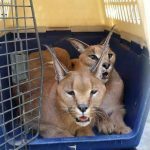 Tonka and the caracals made the long two day journey and arrived in the wee hours of a Sunday morning. At daybreak, they were more than anxious to get out of their transport carriers. Nigel and Ivan, born in 2000, had lived at the event center their entire lives since being purchased as kittens. They both moved into our large indoor/outdoor quarantine area when they arrived. Though Nigel adjusted right away, something was wrong with Ivan. Sadly, he passed away and we are all heartbroken at his loss. We were saddened that Nigel’s brother, Ivan, passed away upon arrival at TWS and could not experience the same bliss. Ivan, Nigel and Tonka arrived before dawn on a Saturday morning. It was about 4:45 a.m. when sanctuary workers from the sanctuary providing the transport pulled in. They’d driven several days from California to deliver these three new residents who would now call TWS home. 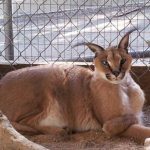 Upon arrival, Ivan the caracal was weak and not walking, but he did not appear to be critically ill. We had no information that would lead us to believe otherwise. Supportive care was given for dehydration, our vet was consulted along with several exotic animal vets and sanctuary directors. He was scheduled to be seen by the University of Minnesota veterinary team that Thursday morning, but Ivan passed away shortly after. We had Ivan in our care for a scant 48 hours before we lost him. His former caretakers, the transport staff from the accredited sanctuary providing transport, and TWS all came together to try and piece together what could have happened to Ivan. With the information we had, it was believed to be neurological (Ivan had a prior history of neurological concerns) or capture myopathy (muscle damage resulting from stress). Everyone was concerned and everyone’s hearts were broken. Conference calls took place to share as much information as possible, as we knew his necropsy report would not be back for several weeks. When it came in, the report raised more questions than answers. The results for his passing were inconclusive, but Ivan had several fractures in his pelvis which explained why he wasn’t walking. His former caretakers said his capture on their end was stressful, but no information given led anyone to believe he had injured himself badly. Our hearts broke again. We may never know what happened to Ivan. Did the stress of the capture and move, mixed with a pre-existing condition, cause this fate? We would only be guessing. But we do know that it is not the ending we wish for any animal. We are here to rescue animals in need – that is our mission. We feel strongly we made the right decisions with the little information we had available. Unfortunately, the USDA cited TWS for not physically bringing Ivan to an emergency vet even though several vets and specialists were consulting on his case. The Wildcat Sanctuary did submit an appeal letter. Since that time, Ivan’s brother has had insulin related issues with similar symptoms and has several tests. We have also informed the USDA of this since being related, Ivan may have had the same condition which requires several meals a day and regulating insulin. Nigel is currently responding positively to treatment. We go to extraordinary lengths to provide the best care possible for each and every one of them. Rescues are hard work, and losing Ivan was heartbreaking and we cried for his loss as we do for each one we say goodbye to. We’ll continue to celebrate his life, though, and do the best we can for each and every animal we rescue. Each time we see Nigel, we know that Ivan’s spirit is here with us, urging us to continue with our mission. We take comfort knowing that’s what he wanted for his brother…. and all those yet to be rescued.